Might even be out of reach for me already, and I've picked up a shoulder strain from sweep rowing at the weekend (obviously not doing it right!) so will be a while before a proper attempt. Great effort by the team so far! 3 boats floating!! Felt like HD already after 10min but kept fighting and ended at 7907, which is around 100m less than my SB and 152 behind PB. Great weekend to you all! Especially to those at BRIC!! 7900+ - cracking row Tako! I found one handful of the extra metres I thought possible from my first attempt at this. Very nice row Tako going plus 7900m. Are you planning to attack the8k mark soon? Well done on your improvement Ian, that's two PBs within one week, isn't it? Thanks Grobi, and yes it is Jon is still safe for the nonathon though. Some impressive results from the team already Good luck everybody with setting new season's and personal bests! I decided to give it a go today, starting conservatively because I was afraid of giving up halfway into the row. It went better than expected though, and I was able to speed up a bit towards the end. I ended up with 7341m, only 3m shy of my SB (which I hadn't checked beforehand because I didn't expect to get near it ). I'm liking the sound of doughnut power - that could become a "thing!". Nice 30 Jan.
Maybe that's the way to do it Good luck for your next effort. Second go today with a hope to at least worry 7500+. My last effort was 7432 so anything above that would be a positive. Went off feeling strong and held that feeling until about half way with 7600+ popping up on the predicted and then I rang out of...well, everything. 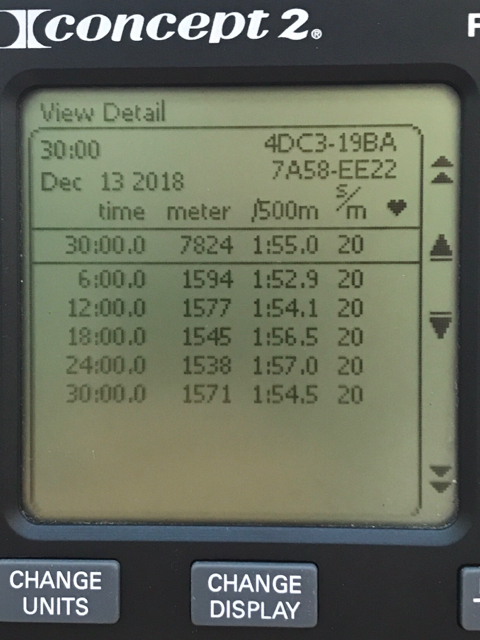 From 14 mins to about 10 it was just hanging on with a huge temptation to quit at 5k (just under 20 mins) as I would take that as a decent row. Decided it was better carry on but back off as 7432 "must" be in the bag barring a catastrophe (and no matter what, I could pull some sort of sprint in the last 30 seconds to grab a few metres - surely?). Anyhoo, much pain later I finished on 7523m ( second best of the season) after having to back off to 2:02.x for the second to last 5 minute split. Sort of happy with the result but not the effort I had to put in to get it. That‘s a very healthy improvement by 91m Dave, very fine effort, you should be really pleased with yourself! I think with a bit more even pacing there‘s further improvement possible. Well done to the recent rowers. >8100m is an impressive row Claudius, and a great improvement from Dave. But then again, Guy will do the same job I guess and that way there will most likely be 2 LWT in boat I, which I cannot recall to have seen before. Impressive!!! Looking forward to see the final results for the CTC 2018. Good luck to all to get great scores. Remember that a tough 30min is a good fat burner for the Holiday season! Impressive row Claudius, and great improvement by Dave! I'm very happy to look forword to Guy having some competition. Lots of enthusiasm for this one I see. And some strong efforts too. Nice one cracking the 7500 barrier Plummy ! I think lwt-Claudius could prove tough to beat in the future !! As usual - incredible pacing for a LWT Guy. Some wonderful rowing going on. Congratulations everyone. Very inspiring to give it another go. It looks like the leightweights are taking over Brilliant rowing by Claudius and Guy, very impressive! It all went pretty much according to plan although I have to admit that things got a bit ugly in the minutes 16-20. 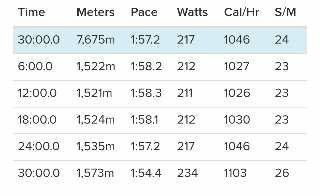 But once I was under 10 minutes remaining it got a bit better and with 3minutes left I was down to my old average pace of 1:57.5. Quite happy with an improvement by 50m and to be finally +7700 again. Great to see boat 1 doing so well.